Russia's literary elite show their support for Mikhail Khodorkovsky by supporting his writings. Less than a month after jailed Russian oligarch Mikhail Khodorkovsky was sentenced to remain in prison until 2017, a book of his writings and interviews has been launched in Moscow, at an event attended by some of Russia's top writers and human rights figures. The book, titled “Mikhail Khodorkovsky: Articles. Dialogues. Interviews,” includes a series of essays which the former Yukos chairman wrote from prison for Russian publications about the future of the country, as well as interviews with leading contemporary writers such as Boris Akunin, Lyudmila Ulitskaya, and Boris Strugatsky. Khodorkovsky, who was once Russia's wealthiest man, was sentenced to 14 years in prison last month together with his former business partner, Platon Lebedev, after both men were convicted of theft and money laundering. It was the second conviction of the pair. The new sentence was backdated to 2003, when Khodorkovsky was initially arrested -- meaning that he and Lebedev will stay in jail for another six years. One of the much-hated oligarchs who made billions in the 1990s, Khodorkovky’s plight received little public sympathy in Russia after his first trial, but his writings from prison, backed by a well-organized publicity campaign and his second trial, widely seen as Kremlin retribution, has seen his support visibly increase, especially among writers and artists. 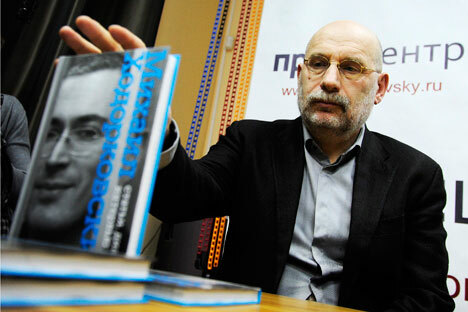 Akunin, author of the best-selling "Erast Fandorin" detective series, interviewed Khodorkovsky by mail for the Russian version of "Esquire" magazine. He says the fallen magnate’s fate appeals to him as an author. Ulitskaya, whose correspondence with Khodorkovsky originally appeared in the journal "Znamya" and is reprinted in the book, says she had many disagreements with Khodorkosvky in their correspondence. But she notes she has been impressed with him and hopes to one day meet Khodorkovsky in person. Parfyonov wrote that readers can see the evolution of Khodorkovsky in the articles. Akunin says Khodorkovsky has become a stronger writer since the former oligarch first wrote to him, and he predicts that some of Khodorkovsky's writings will be taught in schools in the future. The book is already selling well, says Sergei Rubis, director of the editorial department at Eksmo publishers. The publisher says profits from the book will support a children’s home in the Moscow region.